Nestled in the West Gate Restaurant is a well known treasure. 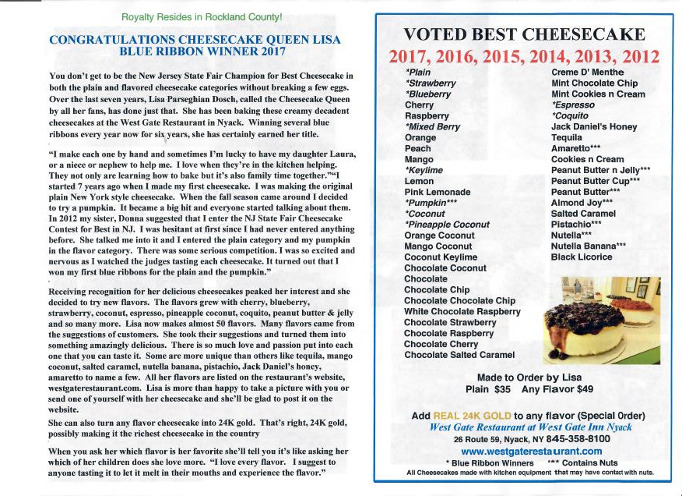 For the past seven years Lisa Dosch has been baking and serving her blue ribbon cheesecakes! 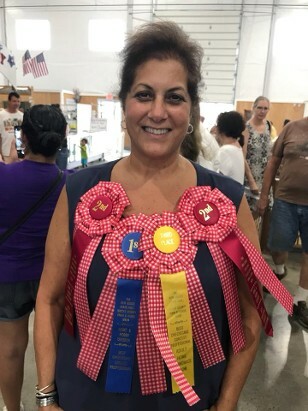 It began in the summer of 2012 when her sister, Donna Maccaro, was insistent that she enter her Pumpkin Cheesecake at the NJ State Fair Cheesecake Contest. “At first I was very hesitant. I had never entered any kind of a baking contest and considered myself a home baker. Far from the professional bakers you see in bakeries.” That first year she entered two categories. The Plain Cheesecake with no topping and the Flavor Cheesecake category. “I was so excited but so nervous at the same time. I couldn’t believe my Plain Cheesecake and Pumpkin won first place. When Lisa is asked what makes her cheesecakes so amazing and loved by many near and far she tells how cliché it may sound, but it’s so true that anything you cook or bake if there is love and passion put into it then it is guaranteed to satisfy everyone. You can taste and feel the passion in all the flavors, every slice, every bite. Lisa has a huge passion for cooking and especially baking from growing up in the kitchen learning from her mother and grandmother. “They taught me the joy of feeding people. Food has always brings my family together and has given us so many fond memories. Bringing people together with my cheesecakes is one of my biggest joys in life.